The Wairarapa Line is a secondary railway line in the south-east of the North Island of New Zealand. The line runs for 172 kilometres (107 mi), connects the capital city Wellington with the Palmerston North - Gisborne Line at Woodville, via Lower Hutt, Upper Hutt and Masterton. The first part of the line opened in 1874 between Wellington and Lower Hutt, with the entire line to Woodville completed in 1897. It was the only New Zealand Government Railways route out of Wellington until 1908, when the government bought out the Wellington and Manawatu Railway Company who owed and operated the present North Island Main Trunk section between Wellington and Palmerston North. The line originally included the famous Rimutaka Incline, which used the Fell mountain railway system to cross the Rimutaka Range between Upper Hutt and Featherston. In the mid-1950s, the line between Petone and Featherston was substantially realigned, with the line diverted to the east of the Hutt River between Petone and Haywards to serve new housing developments in northern Lower Hutt, and the construction of the Rimutaka Tunnel to replace the Rimutaka Incline. Part of the former route west of the Hutt River has been retained as the Melling Branch. The southern portion of the line between Wellington and Upper Hutt is electrified and is also known as the Hutt Valley Line. Tranz Metro on behalf of the Greater Wellington Regional Council runs suburban services along the Hutt Valley section, as well as the Wairarapa Connection service between Wellington and Masterton. KiwiRail runs regular freight services along the line between Wellington to Masterton and between Pahiatua and Woodville. No regular services currently run along the Masterton to Pahiatua section, and this section is currently under review as part of KiwiRail's turnaround plan. Four branch lines diverge from the Wairarapa Line: the Melling Branch, and the Gracefield Branch to Hutt Workshops, both still open; and the Greytown Branch, closed in 1953, and the Hutt Park Railway, which ceased serving its intended purpose in 1906 but survived in truncated form as an industrial siding until 1982. It was also proposed to build a branch line to Martinborough but this line never eventuated. Proposals for railed transportation out of Wellington were made as early as the start of the 1850s, barely a decade after European settlement of the area began. In 1853 and 1857, investigation of horse-hauled tramways was undertaken, but no action was taken. Robert Stokes, a member of the provincial government, proposed a railway over the Rimutakas in 1858 and finally succeeded in gaining government interest in 1863. The government established a committee to investigate proposals, and on 2 July 1866, the Wellington, Hutt Valley, And Wairarapa Railway Ordinance was passed. It authorised a railway employing either 3 ft 6 in (1,067 mm) or 1,435 mm (4 ft 8 1⁄2 in) standard gauge to carry 200 tonnes at speeds of 24 kilometres per hour (15 mph), but construction did not commence as sufficient funds were not available in the fledging New Zealand colony, nor were they successfully raised in England. In 1870 Julius Vogel included a Wellington-Wairarapa railway in his Great Public Works policy and visited London to arrange a loan to finance the policy. On this trip he was approached by several contracting firms and a contract that included the first section of the Wairarapa Line was awarded to Brogden & Sons. The construction of the line can be considered in three stages: the Hutt Valley section, the route over the Rimutakas, and the line through the Wairarapa via Masterton to Woodville. On 20 August 1872 construction of the Wairarapa Line began with the turning of the first sod at Pipitea Point, the site of Wellington's first railway station. Construction was delayed due to the difficulties associated with building a railway along the narrow, rocky shoreline of Wellington Harbour, and the section to Lower Hutt was not opened until 14 April 1874. Further difficulties were encountered in building the rest of the route up the Hutt Valley along the Hutt River's western bank, including the need to divert the river and reinforce its bank in places. On 1 February 1876 the line opened to Upper Hutt. One of the special locomotives employed on the Rimutaka Incline, H 199, now preserved at the Fell Engine Museum. The Rimutaka Range posed a severe difficulty to those involved in planning and constructing the Wairarapa Line. On 1 January 1878 the Hutt line opened to Kaitoke at the western foot of the range, and a steep but manageable route with a grade of 1 in 39-40 was found from Kaitoke up the Pakuratahi River valley to the site of Summit station, 348 metres (1,142 ft) above sea level. However, from Summit down the eastern slope to Cross Creek near Featherston, a gradient of 1 in 14-16 was required. This was far too steep for regular steam locomotives to handle, and accordingly the Fell mountain railway system was employed. This used a centre rail to which specially-designed locomotives and brake vans clung, allowing them to climb the steep slope upwards or control the descent. Despite the terrain, construction of this unique route was completed swiftly, opening to Featherston on 12 October 1878. Construction from Featherston to Masterton across the Wairarapa plains north of Lake Wairarapa was relatively easy. The decision was taken to bypass Greytown and build the line through Woodside to bridge the Waiohine River at a point far enough up the river to be considered safe; a line through Greytown would have required a bridge at a point considered unsafe by the surveyors. The Greytown Branch was constructed from Woodside, and Greytown was briefly the effective terminus of the Wairarapa Line from the opening of the branch on 14 May 1880 until the bridging of the Waiohine a month later. Later in 1880 the line opened all the way through to Masterton. The northern Wairarapa was more rugged and isolated, and construction was slower and more difficult. Mauriceville, 20 kilometres (12 mi) north of Masterton, was reached on 14 June 1886, followed by the next 6 kilometres (3.7 mi) to Mangamahoe on 10 January 1887. The 10 kilometres (6.2 mi) between Mangamahoe and Eketahuna included the 150-metre (490 ft) long Wiwaka tunnel, the only tunnel between the Rimutaka Incline and Woodville, and the section was opened on 8 April 1889. Construction of the 4 kilometres (2.5 mi) section to Newman was inexplicably slow, not completed until 1896. Pahiatua was reached in May 1897, including the Mangatainoka River bridge, the longest bridge on the line at 162 metres (531 ft). Mangatainoka is 24 kilometres (15 mi) from the bridge and the railway reached it in August 1897, and the line was finally opened to Woodville and a junction with the Palmerston North - Gisborne Line on 11 December 1897. Several upgrades and alterations to the Wairarapa Line have been made, but only the Hutt and Rimutaka tunnel deviations have significantly altered its route. In 1925 construction began on what was then known as the Hutt Valley Branch, leaving the main line just north of Petone station and running east to Waterloo, opening on 26 May 1927. After World War II, new state housing suburbs developed north of Waterloo, and the railway was extended to serve them. In 1954 it re-joined the western line south of Manor Park and superseded the old route. On 1 March 1954 the former Hutt Valley Branch became part of the Wairarapa Line and the western route was truncated into the Melling Branch from Petone. The Rimutaka Incline was difficult, costly and time-consuming to operate, but as the Wairarapa Line had become a secondary route since the acquisition of the Wellington and Manawatu Railway in 1908, its replacement was not a priority. Various alternate systems and routes were debated, with a tunnel chosen in 1936. However, the economic conditions left from the Great Depression followed by the impact of World War II meant that work on the tunnel did not start until 1948. The Incline and the line up the western side of the Rimutakas closed on 29 October 1955 and the tunnel opened on 3 November 1955. When the full line opened in 1897, passenger services from the Hutt Valley to Wellington were augmented by NZR's first express from Wellington, the Napier Express (the WMR had operated the Wellington-Longburn portion of the New Plymouth Express). After the acquisition of the WMR, the Napier Express was re-routed to the quicker west coast route in early 1909 and the Wairarapa Mail was introduced to provide a regular service through the Wairarapa to Woodville. In 1936, RM class Wairarapa railcars were introduced; these were designed to operate at speed over the Rimutaka Incline and provided a much quicker service to Wellington and local Wairarapa services. They originally augmented the Wairarapa Mail but replaced it in 1948. Carriage trains operated only at peak times of the year when the railcar capacity was exceeded; in 1955, the Incline's closure meant the Wairarapa railcars were withdrawn and 88 seater railcars were introduced, boosting capacity at off-peak times. One Wairarapa railcar has survived and is currently under restoration by the Pahiatua Railcar Society. Mixed trains also operated until the 1950s. EW 1805, which operated on the Hutt Valley Line. 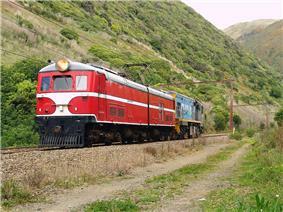 It survived for preservation and is seen here with DC 4611 near Paekakariki on the North Island Main Trunk Railway. In the 1950s the Hutt Valley line was electrified using the 1500 V DC system already operating to Johnsonville and Paekakariki. The electrification was opened to Taita on 12 October 1953 and Upper Hutt on 24 July 1955, allowing for a more intensive suburban commuter service to Wellington. Originally operated by DM/D class electric multiple units and carriage trains hauled by ED and EW class electric locomotives, many of the DM/D units were phased out upon the introduction of the "Ganz-Mavag" EM/ET class units in the early 1980s. The "Matangi" FP/FT class was introduced on the Hutt Valley Line in 2011-12, relegating the Ganz Mavag units to peak services. Proposals have been made to extend the electrification into the Wairarapa and the Rimutaka Tunnel was constructed to allow wires to be installed. In 2007, the Greater Wellington Regional Council rejected a call for the line to be electrified to Masterton, stating that patronage was too low to justify the capital expenditure. The railcar services survived until 1977, and carriage trains were re-instated progressively from early 1964. Until 1963, a railcar service operated on Friday evenings between Masterton and Woodville, and in December that year the decision was taken to replace the morning railcar to Wellington with a carriage train as over 200 passengers wished to use the railcar service that had a capacity of just 176. The final railcar service was replaced by carriage trains in December 1977; some of the carriage trains from this point until the mid-1980s were made up of de-motorised former 88-seater railcars known as "grassgrubs" in New Zealand railfan jargon. Passenger services through the lowly populated northern Wairarapa survived due to the poor roads in the area, but as they were improved, demand for the trains declined. Masterton – Palmerston North passenger trains ceased from Monday, 1 August 1988 with the last such service running on Friday, 29 July. In the 1990s, the service between Masterton and Wellington was rebranded as the Wairarapa Connection and presently operates five times each way weekdays (with a sixth service in the evening on Fridays), and twice each way on weekends and public holidays. In 2007, eighteen new SW class carriages were introduced to replace the 56ft carriages used since the service's inception; in 2013, they were joined by the six SE class to relieve capacity constraints especially on evening services. Until the acquisition of the WMR in December 1908 all NZR freight out of Wellington was carried on the Wairarapa Line. As soon as the western route became available, all freight that could be diverted off the Wairarapa Line was diverted, due to the difficulties created by the Rimutaka Incline. This meant that even some traffic from the northern Wairarapa was sent through the Manawatu Gorge and down the west coast to Wellington. The opening of the Rimutaka Tunnel made the line more desirable for through freight traffic, but as localised freight gave way to containerised inter-city freight in the 1980s, the significance of the Wairarapa Line declined, especially on the section north of Masterton. KiwiRail is currently investigating a log shipment hub in Masterton that would mean log traffic would use the northern portion of the Wairarapa Line, from Masterton to Napier. In February 2012 it was reported that the total freight carried on the northern section of the line had increased from 74,031 tonnes in 2009 to 97,139 tonnes in 2011, although this figure was inflated by a ten-day closure of the Manawatu Gorge section of the railway line due to a slip. Presently freight service operate at each end of the line. Log and other wood-related traffic is moved between Wellington and Waingawa, just south of Masterton, with one overnight and one daylight return service on weekdays, and a daylight service operates both weekend days. Two freight trains operate from Palmerston North to Pahiatua and return on weekdays, the first in the early hours of the morning and the second in the afternoon. No freights currently operate regularly at weekends. KiwiRail ceased running timetabled revenue services on the Masterton–Pahiatua section of the line in February 2015, transferring the Sunday Wellington to Palmerston North via Woodville run to the NIMT. However, they have undertaken to keep it open and maintain it to an operational standard, in part because it is still in use by heritage operators,  particularly the Pahiatua Railcar Society and Steam Incorporated. In the late nineteenth century, the first members of the K class to operate in the North Island were transferred from the South Island to work the Napier Express. They were augmented by members of the M and N classes. In the twentieth century, typical locomotives included members of the A and AB class. The Rimutaka Incline was almost always operated by the six members of the H class built specifically for it. In 1906 E 66 was built for the Incline but did not prove as successful as the six H locomotives and was retired in 1917. When the Rimutaka Tunnel opened in November 1955, the Wairarapa Line became the first in New Zealand to be fully dieselised as steam locomotives were unable to pass through the tunnel. Initially, DE and DG class diesels were employed, and they were soon joined by the DA class. Until 1967, the Wairarapa Line was the only way DA class locomotives could access Wellington due to tunnels south of Paekakariki being too small. In the 1980s, the DG class had been fully withdrawn and the DA class in the process of withdrawal or conversion to the DC class; accordingly motive power on the Wairarapa Line changed. Until 2015, the DC class was the mainstay of the Wairarapa line south of Masterton, with locomotives of the DBR, DF/DFT and DX classes occasionally used. In July 2015, the DFT class took over services on the line. The Wairarapa line used four of the six New Zealand railway signalling systems: Double Line Automatic (DLA), Centralised Traffic Control (CTC), Track Warrant Control (TWC) and Station Limits. Signalling at Petone is future-proofed for conversion to a fifth system, Automatic Signalling Rules (ASR). Semaphore Signal on an operational line, these were decommissioned in 1996 however the masts (poles) remained in place until July 2014. Prior to the Trentham–Upper Hutt–Featherston section being transferred to Train Control in February 2007, this was the last section with CTC controlled by a signalman. Part-time signal boxes remained at Petone (weekday peak and inter-peak) and at Taita (weekday peak) until December 2013 and July 2014 respectively, when signalling was switched to Train Control in central Wellington. Masterton is a unique signalling arrangement with Track Warrant Control ending at 'TWC Ends' boards north of the two-position home signal, which allows shunting movements to be carried out without the need for a Track Warrant. Along with Horotiu (on the NIMT between Te Rapa and Ngaruawahia) Masterton still has Woods Points Keys. The Horotiu ones are not in regular use. Carterton Railway Station, base of the Wairarapa Railway Restoration Society Inc. Seven railway preservation organisations are based on or close by the Wairarapa Line. NZRLS has a workshop based at the northern end of the Silver Stream Railway where members restoring two Wellington and Manawatu Railway Company carriages. It also has an archives building beside Ava Railway Station in Lower Hutt. The Silver Stream Railway is a heritage railway in Silversteam, Wellington. It regularly operates preserved New Zealand Railways Department locomotives along a restored section of the Hutt Valley Line (part of the Wairarapa Line), deviated in 1954. The Rimutaka Incline Railway Heritage Trust is based at Maymorn Railway Station and its ultimate goal is to return the Rimutaka Incline to full operational condition as a tourist attraction. The Fell Engine Museum is a short walk from Featherston station and includes preserved H 199, the sole Fell steam locomotive left in the world. 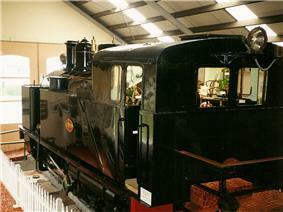 The museum also has a Fell brake van and other railway-related items of historical significance. The Woodside Station Preservation Society focuses its activities on the Woodside Railway Station Building. The Wairarapa Railway Restoration Society focuses its activities on the Historic Carterton Railway Station complex, which includes a museum inside Carterton's historic station building, rolling stock in the station yard, and other heritage items. The Pahiatua Railcar Society is at Pahiatua railway station, which is no longer served by passenger trains but maintained by the society. It has the only surviving Wairarapa and 88-seater railcars and is restoring them to operational condition; it also has an operational Standard railcar. N/A Te Aro Terminus of the Te Aro Extension from 1893 to 1917. N/A Lambton One of two Wellington stations, this was the government counterpart to the WMR Thorndon station and was the terminus of the Wairarapa Line prior to the opening of the combined Wellington station in 1937. 0.00 km (0.00 mi) Wellington Photo This station became the combined terminus for both the North Island Main Trunk and the Wairarapa Line when it opened in 1937. N/A Pipitea Point This was Wellington's first railway station and operated from 1874 to 1884. 2.55 km (1.58 mi) Kaiwharawhara Photo Both the North Island Main Trunk and Wairarapa Line are served by this station which opened in 1874. Kaiwharawhara Station was closed suddenly in June 2013 as it was discovered how badly corroded the overbridge was. In November 2013, the GWRC voted to close it permanently as on health and safety grounds, it was too expensive and nearly impossible to upgrade the station to provide step free access via ramps for disabled passengers. 4.80 km (2.98 mi) Ngauranga Photo Ngauranga was opened at the same time as Kaiwharawhara and is one of the oldest stations on the line. It was moved from its original site in 1965 due to harbour reclamations and line deviations built during the 20th century. Wellington did have another railway station, Thorndon Railway Station, built by the Wellington and Manawatu Railway Company (WMR or W&MR), but this station did not serve the Wairarapa Line but instead the North Island Main Trunk (NIMT) via Johnsonville. 1.37 km (0.85 mi) Western Hutt Originally known as Lower Hutt and located on the Wairarapa Line, it became a station on the Melling Branch in 1954. It was the terminus of the first section of railway line to open in the Wellington region, and marked the northernmost extent of double-track operations on the Western Hutt section. 2.99 km (1.86 mi) Melling Photo This station serves the suburb of Melling and was originally on the Wairarapa Line. It became the terminus of the Melling Branch in 1954. It was originally on the northern side of the Melling Link road but was moved to its present location when the branch opened. 5.22 km (3.24 mi) Belmont This station served the suburb of Belmont on the Wairarapa Line prior to the closure of this section. 6.65 km (4.13 mi) Andrews Replaced Pitcaithly's in 1938 and closed in 1954. Pitcaithly's Became a tablet station in 1906 and was later replaced by Andrews, a short distance to the south, in 1938. 10.50 km (6.52 mi) Petone Photo This station serves Petone, a suburb of Hutt City. It is at the junction of the Wairarapa Line with the Melling Branch. 12.52 km (7.78 mi) Ava This station serves the suburb of Ava, and was one of the original stations on the Hutt Valley Branch prior to it becoming part of the Wairarapa Line. 14.37 km (8.93 mi) Woburn This station serves the suburb of Woburn and was one of the first stations on the Hutt Valley Branch. It is located at the junction of the Gracefield Branch with the Wairarapa Line. 15.50 km (9.63 mi) Waterloo Photo This station serves Hutt City and is a major public transport interchange. It was the original terminus of the Hutt Valley Branch from 1927 to 1946. 16.54 km (10.28 mi) Epuni Photo This station serves the suburb of Epuni and was opened in 1946 when the Hutt Valley Branch was extended north to Naenae. 18.25 km (11.34 mi) Naenae This station serves the suburb of Naenae and was opened in 1946 when it became the second northern terminus of the Hutt Valley Branch. 19.49 km (12.11 mi) Wingate This station serves the suburb of Wingate and was opened in 1950. 20.55 km (12.77 mi) Taita This station serves the suburb of Taita and was opened in 1947. 21.98 km (13.66 mi) Pomare This station serves the suburb of Pomare and was opened when the Hutt Valley Branch became part of the Wairarapa Line in 1954. 23.70 km (14.73 mi) Manor Park This station serves the suburb of Manor Park. It was known as Haywards prior to the opening of the Hutt Valley Deviation in 1954. Silverstream Bridge This station was on the Wairarapa Line until the opening of the Silverstream Deviation in 1954. 26.83 km (16.67 mi) Silverstream This station serves the suburb of Silverstream and was opened along with the Silverstream Deviation in 1954. 28.24 km (17.55 mi) Heretaunga This station serves the suburb of Heretaunga and was opened in 1908. 29.40 km (18.27 mi) Trentham This station serves the suburb of Trentham and was opened in 1907. It is the northern terminus of double-track operations on the Wairarapa Line. 31.30 km (19.45 mi) Wallaceville This station serves the suburb of Wallaceville and was opened in 1879. 32.40 km (20.13 mi) Upper Hutt Photo This station serves the city of Upper Hutt and was opened in 1876. It marks the northernmost extent of electric operations on the Wairarapa Line. Mangaroa Photo One of the original stations on the Rimutaka section, this station served the small settlement of Mangaroa. Closed in 1955 along with the old route over the Rimutaka Range. Kaitoke Photo One of the original stations on the Rimutaka section, this station served the small settlement of Kaitoke. Closed in 1955 along with the old route over the Rimutaka Range. Summit Photo One of the original stations on the Rimutaka section, this station existed solely to serve the operational requirements of the Rimutaka Incline. Closed in 1955 along with the old route over the Rimutaka Range. Cross Creek Photo One of the original stations on the Rimutaka section, this station existed solely to serve the operational requirements of the Rimutaka Incline. Closed in 1955 along with the old route over the Rimutaka Range. Pigeon Bush Photo One of the original stations on the Rimutaka section, this station served the South Wairarapa region around the area known as Pigeon Bush. Closed in 1955 along with the old route over the Rimutaka Range. 38.75 km (24.08 mi) Maymorn Photo Opened in 1955 as the only station on the Rimutaka Deviation. Originally known as Mangaroa. The Rimutaka Loop, located at 48.41 km (30.08 mi), was opened in 1955 as a remote crossing loop on the Rimutaka Deviation on the Wairarapa Side of the tunnel and closed in November 1990. Though not a station in the true sense it is a significant location signalling-wise due to its treatment as a fully interlocked passing/crossing loop. 57.15 km (35.51 mi) Featherston Photo This station serves the town of Featherston. 60.98 km (37.89 mi) Fernside Photo This now closed station served the small settlement of Fernside, north of Featherston. 65.12 km (40.46 mi) Woodside Photo This station serves the small settlement of Woodside, and Greytown by bus. 69.61 km (43.25 mi) Matarawa Photo This station serves the small settlement of Matarawa. 73.48 km (45.66 mi) Dalefield Photo This now closed station served the small settlement of Dalefield, south of Carterton. 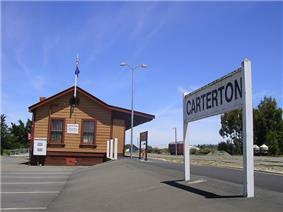 76.60 km (47.60 mi) Carterton Photo This station serves the town of Carterton. 79.33 km (49.29 mi) Clareville Photo This station, closed in 1970, served the small settlement of Clareville, north of Carterton. 83.40 km (51.82 mi) Middleton This small flag station was closed not long after the line opened, in 1891. 85.11 km (52.88 mi) Waingawa Photo This station, now closed to passengers, serves neighbouring industrial customers. 88.09 km (54.74 mi) Solway Photo This station serves the suburb of Solway, in Masterton. 89.40 km (55.55 mi) Renall Street Photo This station serves the area around Renall Street, Masterton. 90.96 km (56.52 mi) Masterton Photo This station serves the town of Masterton. It marks the northernmost extent of the Wellington suburban passenger network. 97.25 km (60.43 mi) Opaki Photo This station served the small settlement of Opaki. 103.53 km (64.33 mi) Kopuaranga Photo This station served the small settlement of Kopuaranga. 110.56 km (68.70 mi) Mauriceville Photo This station served the small settlement of Mauriceville. 116.57 km (72.43 mi) Mangamahoe Photo This station served the small settlement of Mangamahoe. 126.82 km (78.80 mi) Eketahuna Photo This station served the town of Eketahuna. 130.18 km (80.89 mi) Newman Photo This station served the small settlement of Newman. 137.28 km (85.30 mi) Hukanui This station served the small settlement of Hukanui. Decommisned about 1977, Closed to passengers approx 1981. Station included Postoffice, Good Shed and Loading bank. 144.82 km (89.99 mi) Mangamaire This station served the small settlement of Mangamaire. 147.91 km (91.91 mi) Konini This station served the small settlement of Konini. 154.62 km (96.08 mi) Pahiatua Photo This station served the town of Pahiatua. 159.10 km (98.86 mi) Mangatainoka This station served the small settlement of Mangatainoka. 163.89 km (101.84 mi) Ngawapurua This station served the small settlement of Ngawapurua. 171.50 km (106.57 mi) Woodville Photo This station served the town of Woodville. Currently the only private sidings in use are Jukken Nisho at Waingawa and Fonterra at Pahiatua. The sidings remain at Taratahi but the main line points were removed around 2003 (Ravensdown Fertiliser). Lime Works at Mauriceville are also still connected to the network but are overgrown and covered with lime. The former siding at Eurocell (Parapine) in Upper Hutt closed in 2012. Extensive sidings at Petone, Naenae (where the goods shed remains, in non-rail use), Taita (Unilever) and Trentham (Army) have been closed and removed. Other former sidings include one used by oil companies between Renall St and Masterton stations; disused sidings at Mauriceville and Eketahuna; the Ngauranga Industrial Siding to an abattoir in the Ngauranga Gorge; and a siding to a military camp north of Featherston during World War I. Nine tunnels have been constructed on the various routes of the Wairarapa Line. Of these, only three are still in use for railway purposes, and only the Wiwaka tunnel in northern Wairarapa has remained unaffected by deviations since the line opened. Five of these tunnels are now part of the Rimutaka Rail Trail: Mangaroa, Pakuratahi, Summit, Siberia and Prices. The Rimutaka Incline Railway project hopes to incorporate these tunnels into its restored railway line across the Rimutaka Ranges. ^ "Wairarapa Corridor Consultation" (PDF). ^ "Wairarapa rail won't go electric". ^ Bromby, Robin (2003). "Main Lines – North Island". In Olphert, Lorraine. Rails That Built A Nation: An Encyclopedia of New Zealand Railways. Wellington: Grantham House Publishing. p. 40. ^ Churchman, Geoffrey B.; Hurst, Tony (2001) . "Wellington". The Railways of New Zealand: A journey through history (Second ed.). Wellington: Transpress New Zealand. p. 160. ^ Matt Stewart (15 August 2011). "KiwiRail in talks to revive Wairarapa rail line". ^ "Pahiatua rail link looking up". ^ Yong, Alisa (3 June 2015). "Line to Pahiatua stays open". Wairarapa Times-Age (Masterton: NZME. Publishing). Retrieved 3 June 2015. ^ Norman, Emily (2 July 2015). "Faster locos mean timely rides - council". ^ WILLIAMS, COLIN (1 February 2012). "Eurocell site sold off". Upper Hutt Leader (Upper Hutt: Fairfax New Zealand). Retrieved 27 June 2014. Churchman, Geoffrey and Tony Hurst Railways of New Zealand: A Journey Through History, Auckland: HarperCollins, 1991, pp. 151–162. Leitch, David and Brian Scott Exploring New Zealand's Ghost Railways 2nd ed., Wellington: Grantham House, 1998, pp. 39–43. Mahoney, J.D. Kings of the Iron Road Palmerston North: Dunmore Press, 1982, pp. 81–88.